It has been twenty-six years since Abercrombie & Kent’s first polar voyage and, with that experience, every year the portfolio becomes more refined, reinforcing A&K’s position as the leader in luxury expedition cruising. More than 200 expeditions later, A&K still sets the standard with innovation and leadership driving the design and delivery of each and every voyage. Crew and staff continue to be hired for their unparalleled experience in both the North and South Poles, with each expedition team member having more than 18 years’ experience on average. 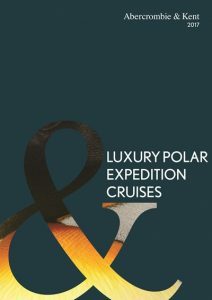 Created by on-the-ground experts, led by a remarkable expedition team of research scientists and naturalists and operated exclusively by A&K on board luxury cruisers Le Boreal and Le Lyrial, the voyages in this brochure reveal the polar reaches at their astonishing best. The elegant guest quarters on both ships are among the most spacious and comfortable on any polar cruise with a choice of bedding configurations. Each carries just 199 guests and every cabin has a private balcony. Both ships have an ice rating which exceeds that required in the demanding polar conditions and are equipped with the latest navigation, communications and safety equipment. A technologically-advanced stabilising system minimises the effect of rough seas. The new collection presents the most innovative and exclusive voyages to the polar regions with A&K’s renowned Expedition Team. Southern highlights include Classic Antarctica and Antarctica, South Georgia & the Falkland Islands and in the north, Arctic Cruise Adventure: Norway, Greenland & Iceland and the Northwest Passage: From Greenland to the Bering Sea. All are truly epic journeys. Valid in Cabin Categories 1 – 3 for bookings made by 31 March 2017.